Once upon a time, Fred the Clown was in the circus and he saw someone called Melissa the Clown. They went for tea. 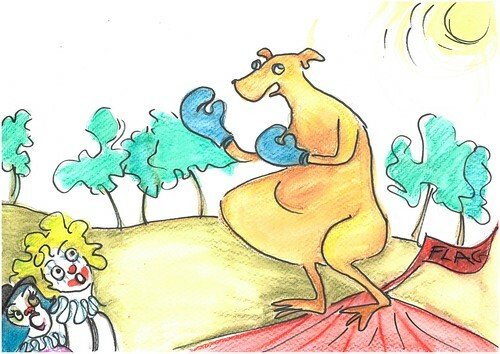 And at the café, a kangaroo showed up with boxing gloves. When the kangaroo came in, Fred the Clown started to get a little nervous. The kangaroo wanted to start a boxing match. When the kangaroo hopped over to the table, Fred the Clown fell into his cup of tea. He ran into the bathroom and Melissa started to talk to the kangaroo. 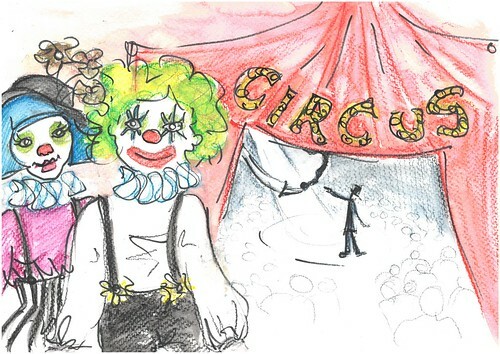 Melissa started blushing and they ran away from the café, back to the circus. The kangaroo ran over and hit Fred in a drop kick. Melissa was mad at Fred for saying they were married, because they weren’t actually married. They had only met that morning. The kangaroo was sitting on top of the circus tent and Melissa kicked him off! The kangaroo broke his arm.